Coinbase news & updates - new altcoins listed, 12 days of Coinbase, etc! Coinbase news & updates – new altcoins listed, 12 days of Coinbase, etc! Coinbase, the most popular fiat to crypto exchange in the US, has been very busy lately, even in this bear market. On the December 7th, they announced their intention to list >90% of all compliant digital assets by market cap. This is a big deal, but they plan to do this “over time” which is pretty vague. So what cryptocurrencies has Coinbase been focused on lately? So far BAT, ZRX, ETC, BCH, MANA, ZEC, DNT, CVC, LOOM, in addition to the more traditional BTC, ETH, and LTC, have all hit the marketplace. Cryptocurrency traders/investors have long been waiting for easier access to various altcoins that they may have their eyes on, so this news is substantial for them. But wait… there’s more! 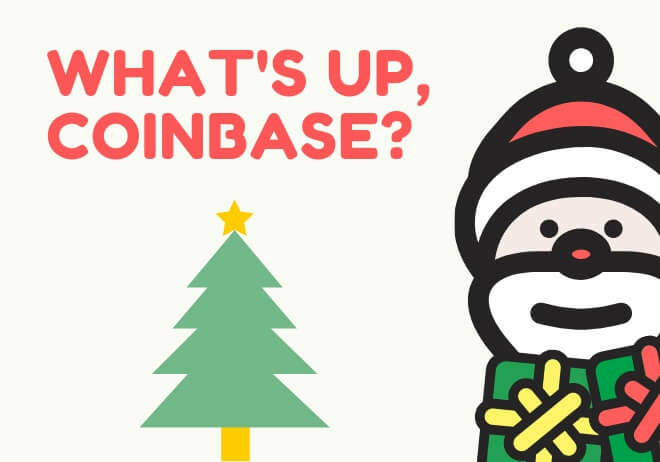 Coinbase recently announced the “12 days of Coinbase” where each day at noon PST they will announce new features, such as support for new cryptocurrencies, etc. On the 1st day of Coinbase, they announced cryptocurrency online gift cards. The crypto e-gift cards can be purchased here. The way it works is simple. First, you select your Coinbase wallet, then you’ll select the amount you wish to spend, and finally you’ll select the e-gift card you want to purchase. It’s a simple process and there’s no fees for you or anyone you send the e-gift cards to. To make things better, you actually get a bonus for buying them. So if you were planning on buying some Nike shoes this holiday season, or perhaps you enjoy shopping at GAP, or you know that you’ll be using Uber often, these e-gift cards could be a good idea for you (or a loved one). But enough about crypto e-gift cards, what’s Coinbase been doing besides that? It turns out that, on the 2nd day of Coinbase, 100 families in Santa Elena (Venezuela) will receive $1 in ZEC (Zcash) every day for three months. This amounts to a $10,000 dollar in value ZEC donation by way of GiveCrypto (https://www.givecrypto.org/). The reason for the donation is to highlight a side project of Brian Armstrong, CEO of Coinbase, who feels that charity is an area in which cryptocurrencies can really make an impact. Some might say what’s a dollar a day? But to these families who live under an oppressive regime with a larger devalued fiat currency, it could mean 1-2 kilos of protein or 2 kilos of starches and vegetables. For the 3rd day of Coinbase, they released a video that highlights the importance of cryptocurrency and its role in the future. 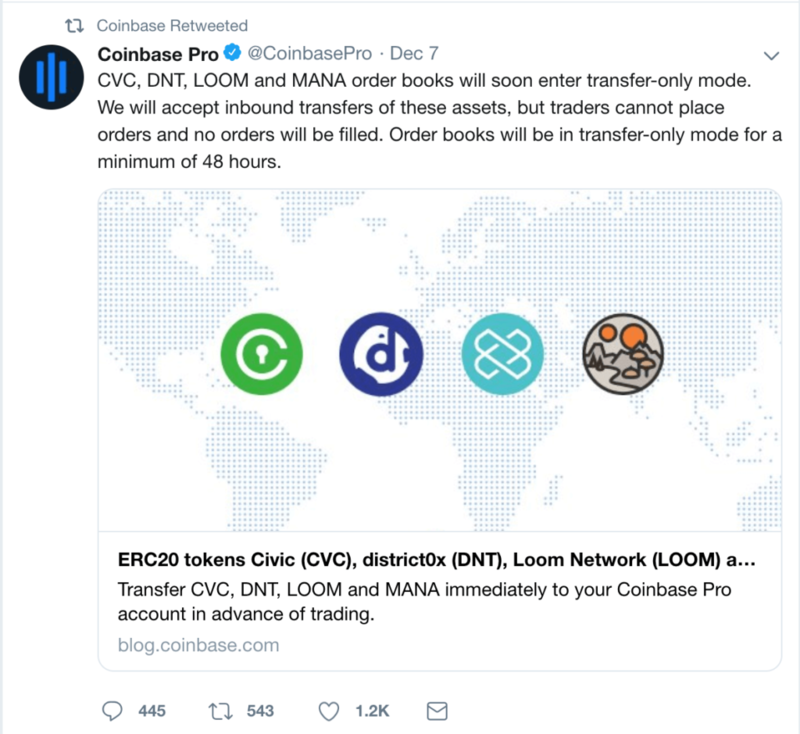 This serves as a great marketing piece for Coinbase but it also accomplishes the goal of helping to create the open financial system of tomorrow. Coinbase seems to be headed in the right direction, doing things to help those in need while introducing financial services to people who can benefit the most. I look forward to the next 9 days of Coinbase to see what they announce and how it affects the crypto space as a whole.